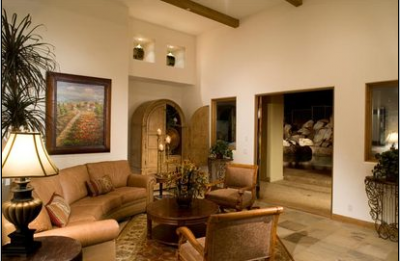 Tuscany Heights, located above beautiful Palm Springs offers the most in luxurious dream homes. Some of the finest Southern California real estate, each home is one-of-a-kind, designed to blend in with the land. 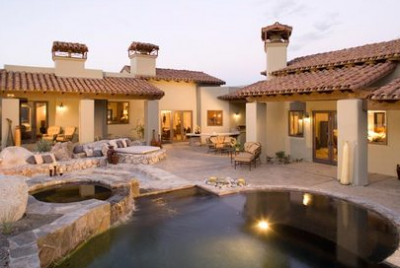 Combined with the wonder of desert, this community offers picturesque views of the valley below. 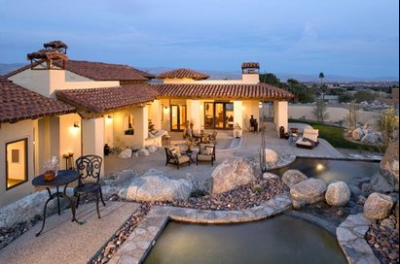 The homes and landscapes feature the resources provided by Mother Nature, including huge boulders and natural rock, creating a sense of natural beauty amidst the desert background. 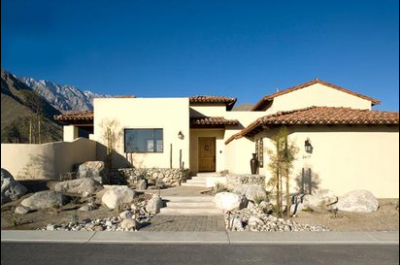 Some of the most creative Palm Springs real estate available, the features of the Tuscany Heights homes are fabulous. From the dramatic entryways to the most luxurious of bathrooms, Tuscany Heights homes offer the best that man and nature has to offer. Offering the most in outdoor entertaining, each home is equipped with spacious outdoor entertaining areas, luxurious swimming pools and spas designed to give the impression of rising out of the desert floor, outdoor showers, and a natural landscape surrounded by a privacy fence. The inside of the Tuscany Heights homes brings a feeling of peace and tranquility as the desert landscape is represented throughout. Each home features three spacious bedrooms, each with it’s own entrance/exit onto a private terrace or patio, walk-in closets, and a private bathroom. The master bedroom features two walk-in closets and a luxurious bath. Each home has a formal entryway and living room as well as a family room ? perfect for formal entertaining or spending a quiet evening with the family. Each home also features the best in home appliances including Wolf Stainless Steel kitchen appliances, slab granite countertops, and Kohler cast iron kitchen sinks, and oil-rubbed bronze fixtures in the kitchen, laundry, and bathrooms. Wrought iron chandeliers and sconces, hand-selected floor tiles and premium carpet, and ceiling fans give each home a touch of elegance and beauty. For over half a century, Oliphant and Williams Associates, Inc, builders of these luxurious Tuscany Heights estates, have been one of the most trusted names in California real estate. A knowledge of the landscape and culture of the Coachella Valley enabled Oliphant and Williams to create this visionary community that appears to be one with nature. Are you searching for a community that lets you commune with nature in the most luxurious and relaxing environment? Search no more for your dream home. With 15 spacious, private, and luxurious estates, Tuscany Heights may be the answer for you. Why not tour one of these marvelous estates today? If you would like to see property at Tuscany Heights or Little Tuscany, please call us at the numbers below. Were committed to helping you find the home of your dreams.